Once upon a time in Amsterdam, it was a sunny afternoon in spring when I was inside tram 5. Chattering crowds in multiple languages, buzzing sound of operating (tram) machine, the bell tolls and the station name announcement from the driver formed an orchestra of the day. Bunch of standing people jostled inside, grasping handles hanging on the ceiling. Brushing each other’s shoulder or being bumped by somebody else’s handbag seemed inevitable. Those who managed to find a seat in that kind of situation felt like winning a lottery. I was one of the 80 per cent of those unlucky passengers because I had to stand inside the cramped tram. In other words, I didn’t (feel like) winning a lottery. I heard someone speaking my language. Was that for me? The question I heard was indeed from a Caucasian guy with dark blonde hair and blue-green eyes, who stood before me. His look could probably compete that of the character Charming from a twisted fairy tale drama series Once Upon a Time. He continued our conversation in Bahasa Indonesia. This guy, let’s call him Prince Charming – or Charming, asked me the purpose of my visit to The Netherlands. The words coming from his mouth made me forget that he was European. The way he articulated every word, performed the accent and intonation accordingly sounded nearly flawless. He had very good diction, too, defining that he didn’t learn the language solely by the book since he nailed all the daily terms and slang. It reminded me that after several years living in The Netherlands, I was still not able to speak Dutch like the way Charming spoke Bahasa Indonesia and that was a shame on me. Being an international student taking a program conducted in English in the university results in no sense of urgency to learn Dutch. I practiced the language when I ordered some food in restaurants, asked for a road direction, did a part time job in the store, yet I didn’t blend in that much with local (Dutch) students. Perhaps it was the reason why I couldn’t excel it like a pro. Finally found Charming truly made my day at the moment. I mean, who could refuse a good-looking guy who initiated a conversation with a mundane like me? He got my attention not only by his look, but also with his fluent Bahasa Indonesia. Hearing someone speaking my language overseas somehow felt like home, not to mention it signifies high appreciation in other people’s culture when spoken by a foreigner. Charming admitted that he often mingled with Indonesian friends in The Netherlands, had been visiting Indonesia before and had a distant family who were Indonesian descendants. Mostly, he picked up words, intonation and slang from his Jakarta friends, something I already had guessed earlier. No wonder why he managed to speak Bahasa Indonesia so well. There was a chemistry between us, though it wasn’t a defining moment yet to legitimately say I had a crush on him. I got a piece of him in that sense, and I totally bought it. I would love to hear more about him, especially who this Charming was actually. Age was a bit sensitive to ask, but I believe that he was a few years older than I and no longer a student. So, I wanted to what he did for living. It came to my surprise that an employee in a private company was not the only answer I got, but also his annual salary. Unlike what some of you may think that he was boasting about a six-digit income or something, he frankly told me that he earned about € 40,000 to € 45,000 per year (I don’t remember exactly). Whoa. I thought that salary information is more classified than age. Although he had a decent job in my point of view, Charming had something else to say about it. Oh well, may be I had too much daydreaming about one day my prince will come and exclaim that there’s live a happily ever after despite challenges in life. The idea of talking to someone you just met to complain about life and work is not cool at all. It totally turned me off. That was the name of the station where I had to get off for a transfer. We said goodbye to each other. I was so relieved that I didn’t need to hear more about personal complaints. She had met the same Prince Charming before and had the exact experience as mine. We both agreed that he amazed us with his fluent Bahasa Indonesia and attracted us at first with his look, but the rest was two thumbs down, from voluntarily mentioning salary to searching for a sympathy by sharing his reality bites. Unfortunately, he never knew that he lost his charm every time he did those. Whatever his name was, Prince Charming was officially dead. Living or staying in a city or country for long time is not a guarantee that you’ve seen or known everything. Sometimes you just walk straight home or rush to school or office, unconsciously blocking your sensitivity on things around you. You know all the shortcuts to reach places you frequently visit. Everything you see seems so banal that you may find yourself wondering why on earth tourists are so into red-bricked buildings in Amsterdam while basically they are just everywhere in Holland and look all the same (not entirely true, though). 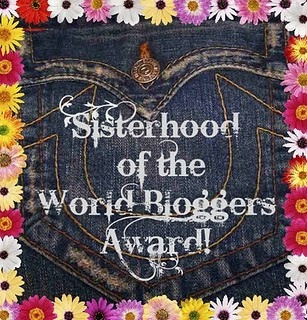 Been there, done that, so what? I revisited Amsterdam last year. The city where I used to live hasn’t changed that much apart from some shops and restaurants are closed and replaced by other huge retail chain stores. I still remember all main streets I passed those days. However, you can call me a big fat liar if I say I know all the streets in Amsterdam. The best way to know what’s in Amsterdam is to pass all the alleys and dare to get lost in between. My former schoolmate and I wandered on streets of Amsterdam and their alleys on Sunday afternoon on foot. Thank God it wasn’t raining. After hours for walking, we felt like sitting somewhere in any cafe nearby. Traiterie Chef was the closest one we could find. Lots of cakes on its vitrine, variety of fresh juices, tea and coffee? That would do just fine. The interior was nothing special, until we came to the first floor. Scroll more, please! Pink rules, from walls, curtains to wallpapers. 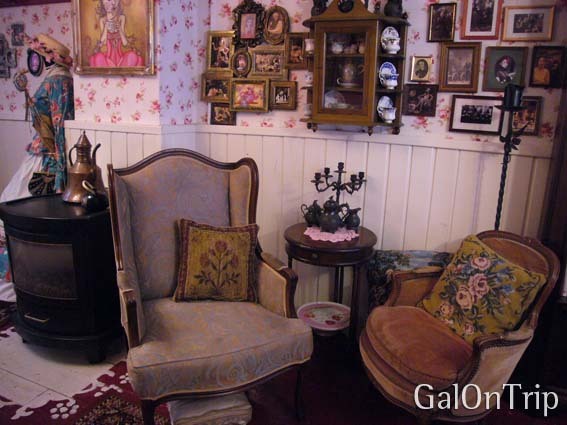 The effort of rich Victorian vintage details exhibited is magnificent for a small dining area. Put your babies in the bed to make sure the won’t screw up displayed goods. You can zip a cup of coffee here, too! 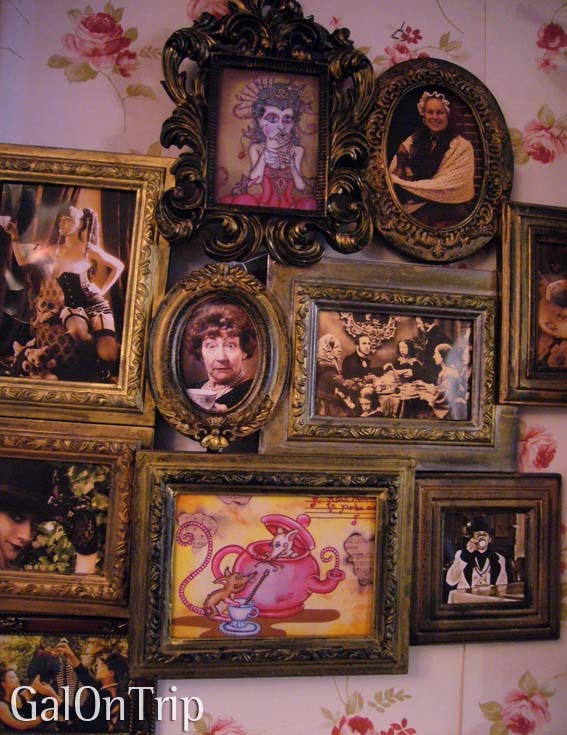 Assorted frames and pictures in one place. 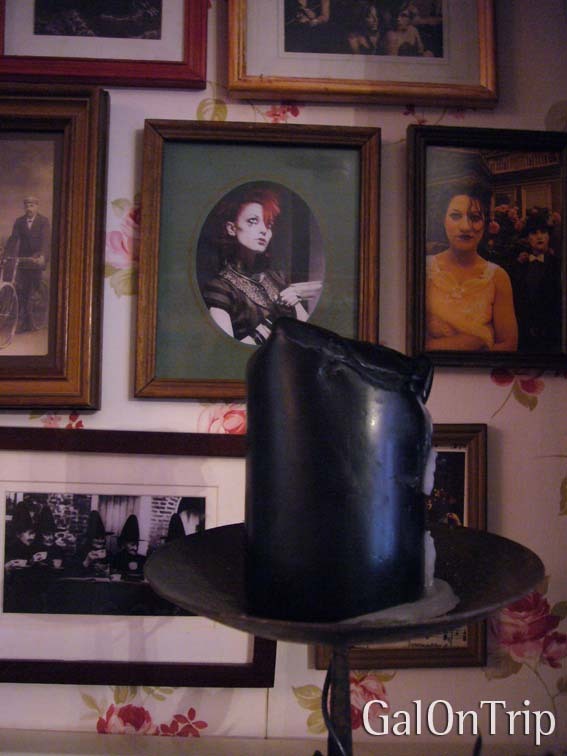 A black candle and its saucer that reminds me of Mad Hatter’s hat. The main dining table that lets you mingle with other guests. 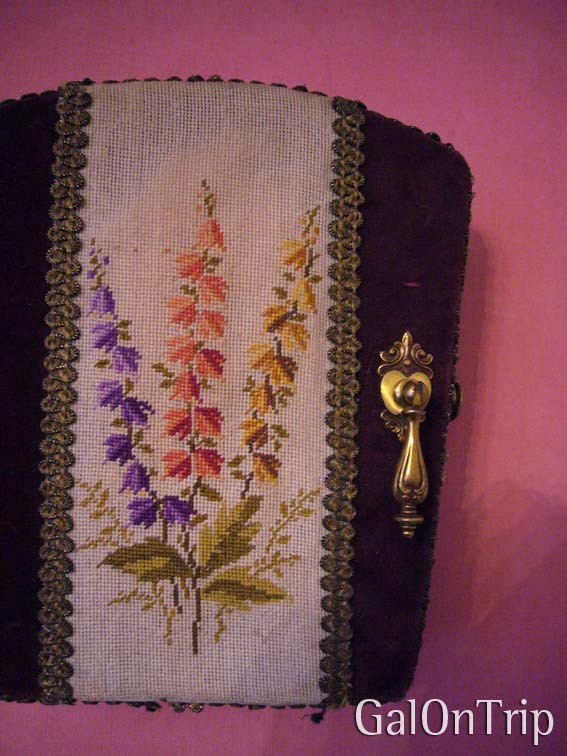 Not everything displayed is really old, but they are so lovely. 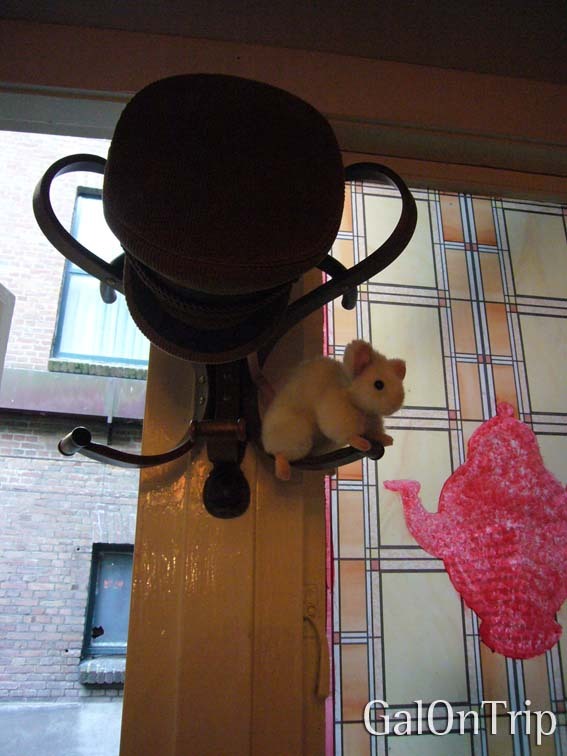 I can’t stand not to have them…..
A very cute detail…a white mouse doll? Sweet…. It’s not just a display. It’s actually a brush to clean the tables. 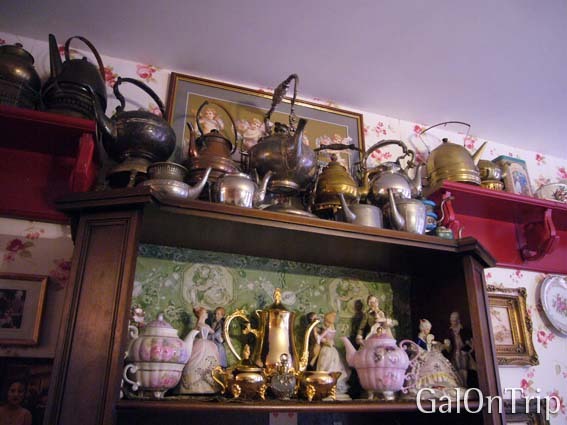 You might say you’re at a granny’s house or an artsy lady with her antiquities. 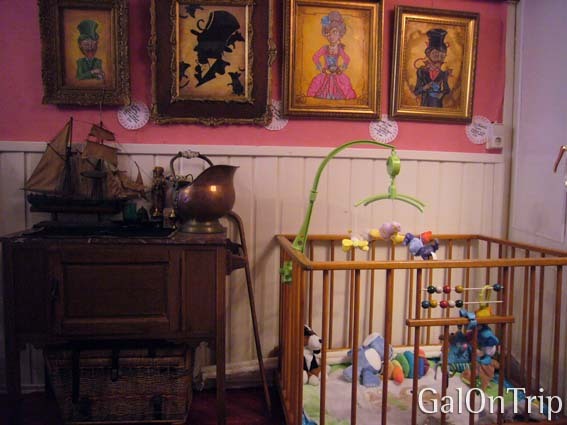 You might say that it’s a vintage museum that makes you feel like home. Whatever you think, let me get this straight: coming to this café means you’re not in the café! My gosh, how come I didn’t know about this place after 7 years in Amsterdam? Again, I repeat: call me a big fat liar if I say I know all the streets in Amsterdam. Suppose you visit the city, I recommend you to drop by and don’t forget to taste the delicious carrot cake. I wonder why they don’t apply the awesome vintage interior on the ground floor as well. It’s one of the selling points they should expose, isn’t it? 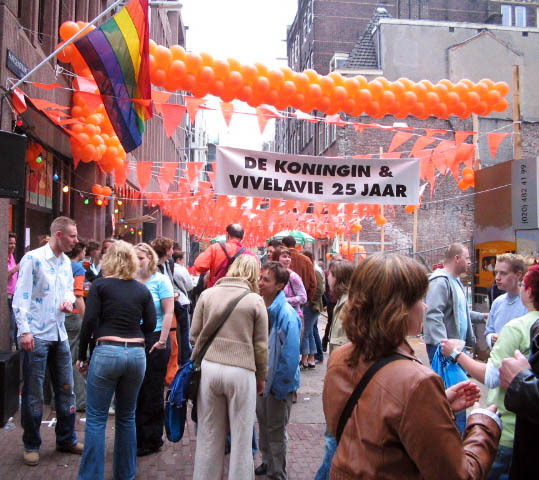 Every year on April 30 is koninginnedag (queen’s day) in The Netherlands to celebrate their queen’s birthday. April 30 refers to Queen Juliana‘s birthday, the mother of Queen Beatrix. Although she passed away in 2004 and her daughter now reigns the country, the date of koninginnedag remains unchanged. It is probably the most joyful day for Dutch people in 365 days apart from spring, summer, winter and Christmas holidays. I joined the crowds for 6 consecutive years in Amsterdam with a group of friends until I left in 2009. I have to thank my friend who captured these wonderful pictures. I borrowed his camera to snap my favourite objects, too. Even though I wasn’t there this year, I believe these pictures taken between 2002 and 2009 still represent the Dutch tradition of celebrating the national festive holiday until now. 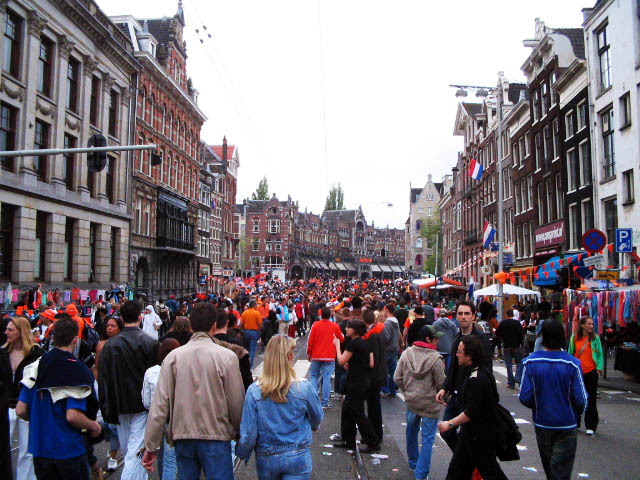 Main streets for public transportation are strictly for pedestrians, especially for koninginnedag. Therefore, trams and buses have to use alternative routes and adjust their schedule. Metro (subway) is more effective to reach distant locations, but walking is the best way to enjoy koninginnedag. 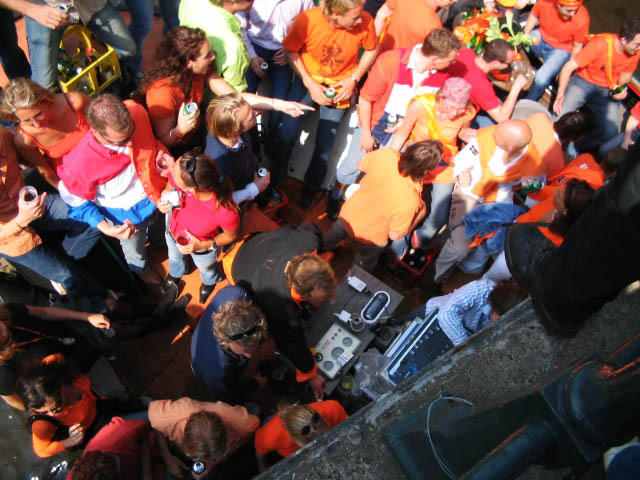 It is interesting to be on street, mingling with oranjegekte – the crowds wearing orange t-shirts, hats, scarves and jackets. Also, find some more orange colour on their hair, face and body. Or Dutch flag colour (red-white-blue) on cheeks and foreheads. Residents decorate buildings with orange – the Royal Dutch colour – attributes. Schools, offices, department stores, boutiques are closed. Flea markets rule on every corner and main street in Amsterdam, whose vendors are ordinary people in the neighborhood from children, adolescents, adults to senior people. So forget about shopping at Zara, G-Star or Diesel on that day – they are closed. 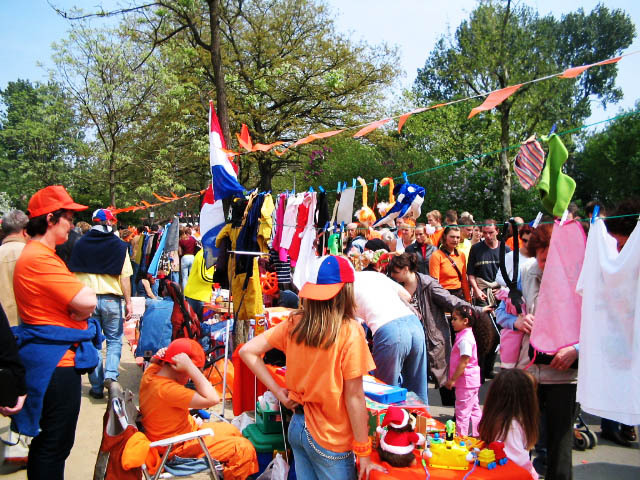 Weeks before queen’s day, participants need to make a reservation to get the spot to spread their carpets, build a tent or stall. 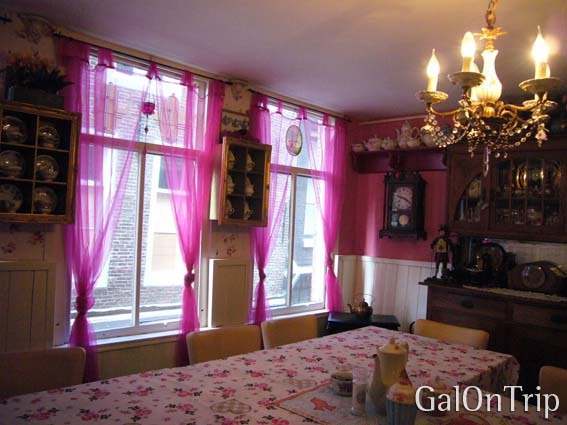 Exclusively on queen’s day, reservations are free and government does not collect taxes from sales income. They sell used personal belongings they want to get rid of. Basically, it’s just the way to participate this special occasion for fun. Earning some euros is a plus. 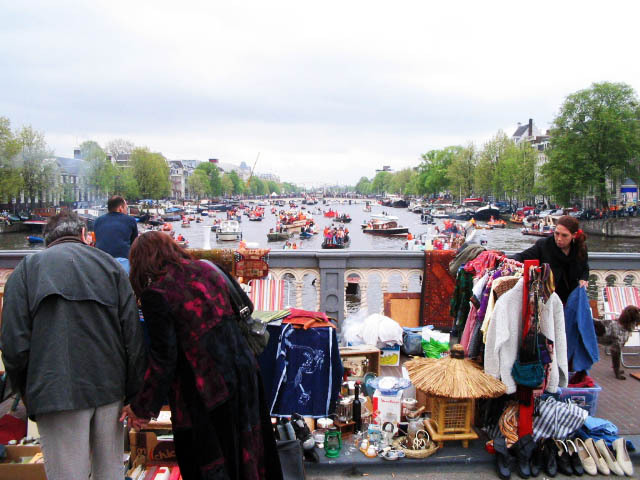 The golden rule for shopping on koninginnedag: cheap second hand goods. Plus high quality or branded equals to perfect. Take your time to walk browsing each stall, including those on the alleys. Surprises are coming to your way. My favourite “hunting field” was near the border of Amsterdam – Amstelveen, whose inhabitants are high-paid expatriates, mainly Japanese and upper class local people. Frankly speaking, Japanese “trashes” (read: used belongings) are the best so far. 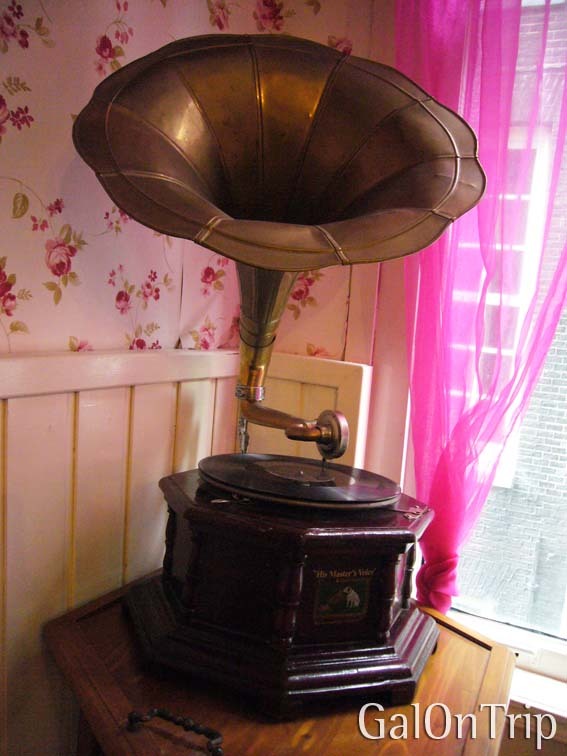 Their goods are too good to tosh in trash, some are even in nearly perfect condition. They sell unique things, such as original merchandise from Japanese airline companies, ANA and JAL (I believe they actually got them for free), Japanese comics, magazines, anime toys, posters and dolls. Take tram 5 or metro 51 to get there, stop at AJ. Ernststraat station, and walk a bit further to the left side. My other favourite “hunting field” was antiquities somewhere at Beethovenstraat. In reality, I never purchased anything from there since my apartment was too small. 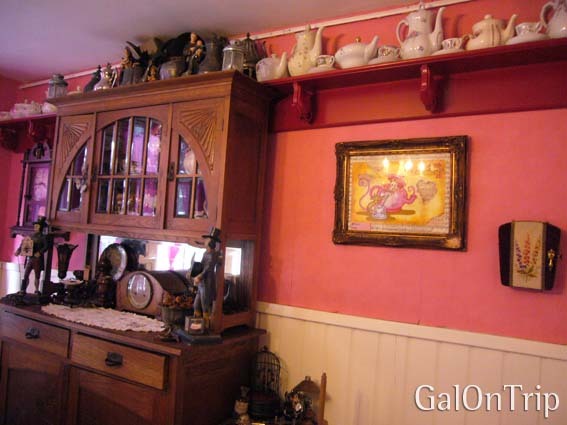 Decorating a place with old stuff without a proper plan means collecting trashes. Moreover, I was a foreigner who never knew where destiny would take me after graduation. Having experience with antiquities is an advantage when it comes to value and originality. I have a fond of them, minus the expertise. The same tram 5 take you there, stop at Beethovenstraat. Suppose there is no tram, just follow tram 5 railway on foot instead. My best second hand deals from various locations: Miss 60 mini skirt (€5), Morgan camisole (€2), Disney Babies baby clothing for my nephew (€15), Pikachu (of Pokémon) handkerchief (€0.70), fluffy anime key chains and dolls (€0.10 – €0.50), Nijntje (Miffy) toilet seat cover (€5). 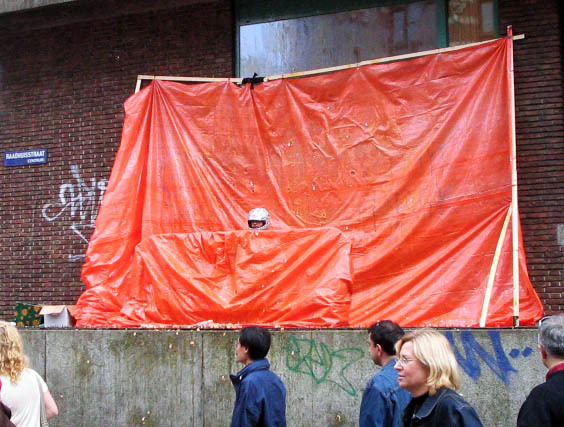 Shopping on queen’s day seems very cheap, but it might end up with bringing other people’s trashes you don’t need. And what if you get snacks and drinks from one stall to another? You’ll be surprised how much you spend in one day. €100 or more? Could be! I tried my best to reduce impulsive buying behaviour to save money. Nonetheless, not all flea markets sell second hand goods. Quite a lot of vendors offer factory outlet garments, branded good fractions, low end electronic gadgets etc. I call these people “the opportunists” and most of them are immigrants from Turkey, Morocco, Eastern European countries to name a few. 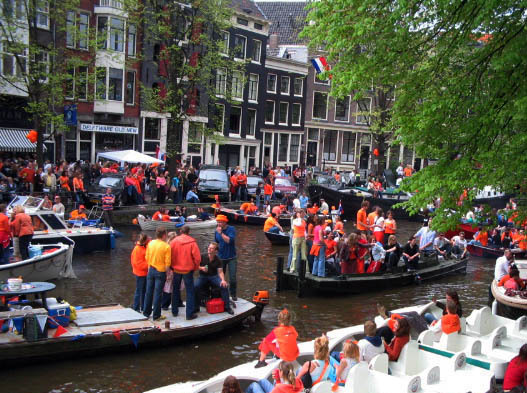 Besides, some souvenir shops – especially in Damrak – and independent retailers selling special priced queen’s day related items, from clothing, accessories to non-permanent paints. Others got lion paw-shaped sandals from ING, “mad hatter” style hat from Heineken and many more. None of them was precious, indeed. Generally, the crowds love the idea of getting stuffs for free, although within a couple of hours they might dump them on street or garbage bin. I like collecting things, so I still keep the one I didn’t blow at home. However, in the end, it depends on your luck. 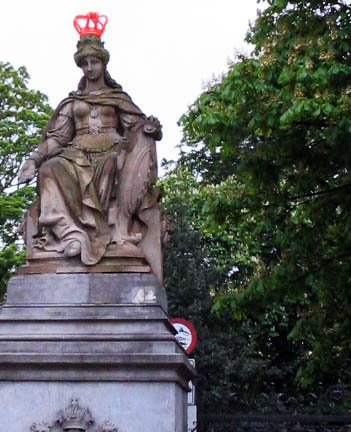 Somebody climbed the pillar to reach the queen’s head at Vondelpark. She was wearing Staatloterij’s balloon crown. Apart from selling second hand goods, residents open stalls selling various kinds of food and drinks. Amsterdam is a multicultural city, street food is not limited to only Dutch food. Chinese spring rolls, dumplings, rice box, Dutch poffertjes, Indonesian loempia’s, fried noodles, German bradwurst, Spanish churros and Turkish kebab. Here, earning euros is mandatory if not just a plus. 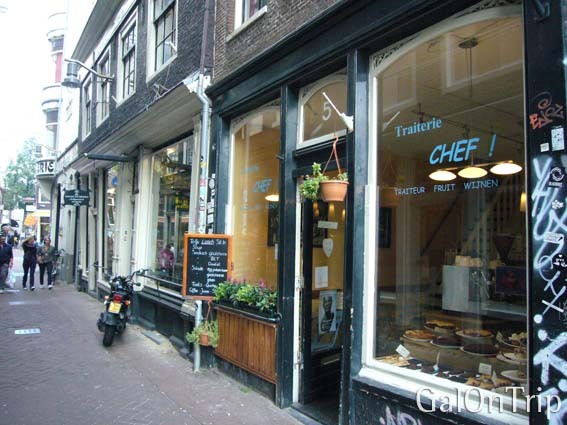 Restaurants, cafes, bars in the city centre usually operate to boost their sales. In fact, many restaurants even purposely build stalls outside their outlets selling special set menus to attract floods of passing crowds. Big supermarket chains like Albert Heijn in touristic areas are open. I prefer buying drinks from supermarkets because they are cheaper than stalls. Opening beverage stalls on queen’s day is usually profitable. Vendors can charge you double when drinks are served cold. 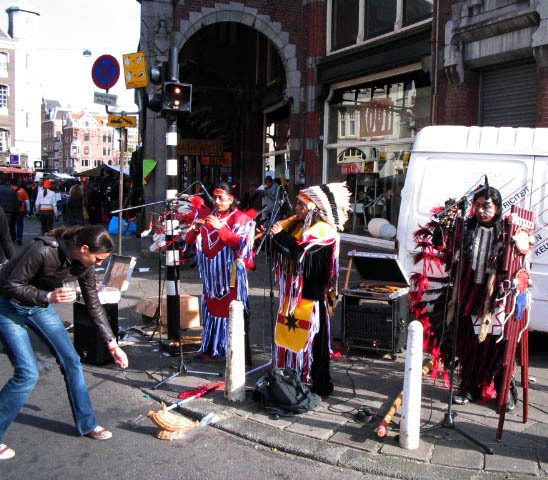 Non-famous musicians try to promote their albums by having live concert on street while displaying CDs or DVDs to sell; music school students put their skill to the test by playing music instruments; residents practice singing and dancing skills in public; amateur DJs and bands entertain crowds voluntarily; amateur gymnasts demonstrate acrobatic movements; unknown street actors do pantomime; etc. 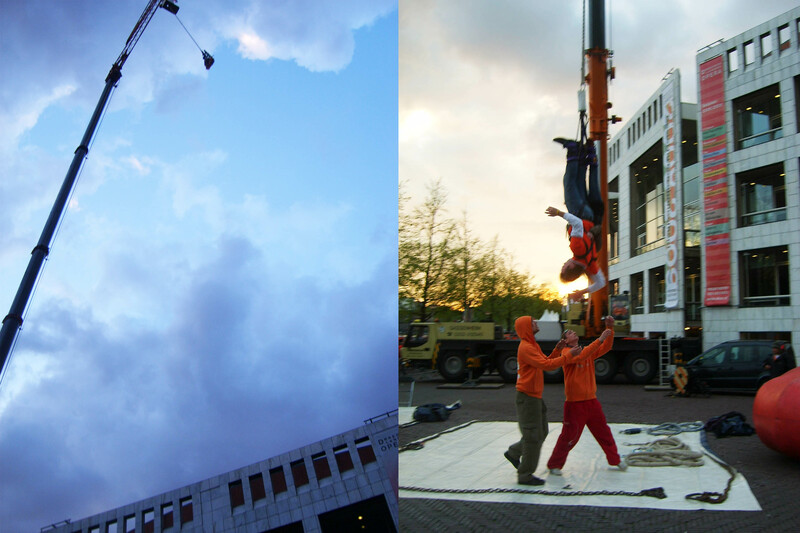 Koninginnedag is the right moment to show performing art capabilities. A lot of them put a glass or a can beside them to get some tips, except amateur DJs and bands on stage. Muziek, dans, biertje! Keep the party rocking! At Teasers Amsterdam, all the girls do not only become oranjegekte and dance on the table inside the bar, but also entertain crowds outside. Dutch bands and singers are in concert in Museumplein free of charge for public. It usually starts after lunch, but I preferred coming after 5 pm since the A-Lists show up later. As the old saying, save the best for last. After the concert, trashes are beyond imagination. Same story for other areas in Amsterdam. For certain people, it’s a blessing in disguise for extra money. The government needs more street sweepers to clean the city back to normal overnight. Besides selling food and second hand goods, residents create games where everyone can join. It requires a small amount of money to join. The games tend to be simple and low cost. I don’t know who organized bungee jumping at that time, but I believe a corporate provided this game since it should be handled by professionals and safety is the biggest concern of all. 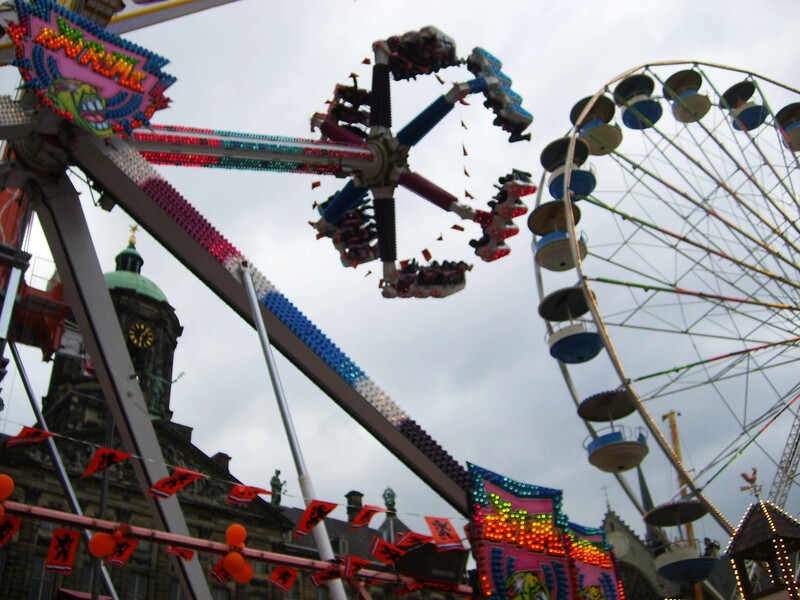 Unlike other games held by individuals or corporate, kermis is not held solely on queen’s day. Amsterdam has it four times a year regardless the nation’s public holiday. Kermis is derived from two Dutch words: kerk (church) and mis (mass). It was originally a market to celebrate a patron saint consecration day. Nowadays, people from big cities neglect the religious meaning of the event. Nonetheless, the fun stays forever. Merry-go-round, haunted house, roller coaster, sling shot, bumper car, you name it. Taste assorted peanut and pop corn flavours, suikerspin, bradwurst, vlaamse frites, oliebollen, waffles after the rides. How about fun ride along Amsterdam canals that stretch for hundreds of kilometers by boat? Otherwise, just watch oranjegekte in action instead. The most inconvenient part of queen’s day is the toilet. The picture shown above is the most common and practical portable toilet available in Amsterdam as it doesn’t waste a lot of space. However, I really despise it because only men can use it and the smell is OMG hell on earth!!! Urinary smell contaminates fresh air since it has no door and you cannot flush it!!! Portable cabin toilets with a door and a flusher are mostly found in the outdoor music concert in Museumplein. The queue is freaking horrible. Some guys who can’t hold it any longer either pee-pee on the grass, behind the bushes or even on corners of the street. Toilet rates at Kentucky Fried Chicken, McDonald’s and Burger King increase, sometimes double, every queen’s day and the queue is also like hell. But at least a bit cleaner than the open air portable toilets. Many restaurants’ toilets are suddenly unavailable for a day with the announcement “GEEN WC” or “NO TOILETS”. It is so understandable why they do that for the sake of their customers’ convenience. Amsterdam Centrum was my daily dose, I passed same routes everyday to go to work and school. I remembered main toilet locations and rates, including the free of charge ones. My favourite toilet spots on queen’s day were Pathé de Munt Cinema and NH Grand Krasnapolsky Hotel in Damrak because they were free all year long. I pretended as a Chinese or Japanese hotel guest at Krasnapolsky, hanging a camera on my neck, and sneaked into the toilet immediately. A few McDonald’s flagships had free toilets at that time, except on queen’s day. Anyways, when nature called and things were inevitable, I directly went to nearest toilet regardless the rate. EPILOQUE: LAST BUT NOT LEAST…. 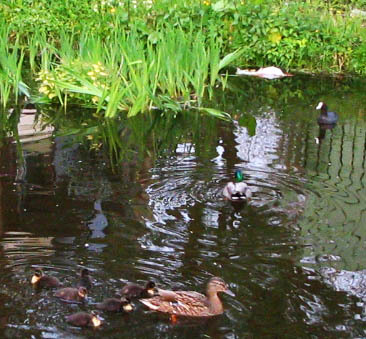 Every year on koninginnedag, I spotted a lot of ducks with their new family members (read: cubs), including in the river in front of my apartment. Was it just a coincidence? 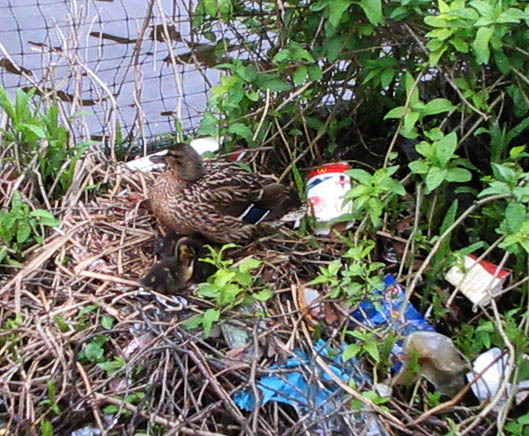 I found the mommy duck and her cubs in their nest somewhere on the side of Amsterdam canal. Littering in their nest is the sign of ignorance of other living creatures living side by side with human beings. So, my dear friends. Several things to remember: beware of pickpockets, hold your breath when necessary, spend your money wisely, don’t get drunk and ruin other people’s happiness, check tram and metro schedules and please litter in provided garbage bin when available. Enjoy queen’s day responsibly. Lang leve de koningin! Long live the queen!